In model shows, as well as the "real" horse show world, there often seems to be much confusion regarding the showmanship class. Showmanship is NOT a halter class! The class description from the AQHA Official Handbook (which would be considered the source for this class) states: "The showmanship class shall be judged strictly on the exhibitor’s ability to fit and show a horse at halter. The horse is merely a prop to demonstrate the ability and preparation of the exhibitor. The ideal showmanship performance consists of a poised, confident, neatly attired exhibitor leading a well groomed and conditioned horse that quickly and efficiently performs the requested pattern with promptness, smoothness and precision. The showmanship class is not another halter class and should not be judged as such." Showmanship classes can most definitely be performed in the "model" world! Standing horses (if standing "square"... such as Lady Phase, Stud Spider, BHR Quarter Horse Stallion, Stock Horse Foal, etc. 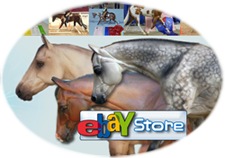 ), walking horses (San Domingo, Indian Pony, John Henry, Stock Horse Mare, etc.) and trotting horses (BHR Hunter, Peter Stone Western Pleasure Horse, etc.) are all appropriate for this class. You can even use a model that is in a "different" sort of pose such as Rugged Lark (he could be doing the "backing" portion of a class pattern). Showmanship is definitely for those "calm and collected" models... not those bucking and kicking "liberty" horses! Halters that "fit" your model are a MUST in a showmanship class! The halter should fit snugly, with the halter conforming to the shape of the horse’s head. The noseband should be positioned halfway between the eyes and nostrils. Dolls are a real "plus" in the showmanship class...since, technically, this class is judged on the exhibitor and not the horse! However, the doll must be dressed impeccably and positioned correctly to enhance your entry. This class "can" be done without a doll (especially if the horse is standing "still")...but the lead must be placed in the same position it would be in if there was a "doll" there...not looped over the withers of the horse and not hanging to the ground...it should look like the person holding the horse is "just barely out of your line of sight"...hard to do if your horse is in motion. Whether "photo" or "live" showing...be sure and include exact information about what your entry is doing!! You don’t have to include a class pattern...you can simply state..."Exhibitor has completed the class pattern and set up her horse for the judge’s inspection." (This is for a model standing square). If your model is "in motion"...you can simply state..."Exhibitor is walking (or trotting) her horse to the judge." OJF Too Kool is a good example of a "light breed" horse in showmanship! "Black Square"... position of doll with horse in "forward" motion. "Black Circle"... position of doll with horse standing square. Depending on which side you are looking at... the doll is on the opposite side from the camera/judge...or in the quadrant "next" to the judge if using the "quarter" system! Judges... Showmanship is a "performance" class with a definite set of rules. Please do not judge it as "just any model with a halter on" class! "The exhibitor MUST lead on the horse's left side...holding the lead shank in the right hand near the halter with the tail of the lead loosely coiled in the left hand. When leading, the exhibitor should be positioned between the eye and mid-point of the horse's neck, referred to as the leading position." OJF Snazzy Express shows a head-on example of the correct way for the doll to hold the lead shank! FOOTNOTE: Regarding the use of lead shanks with stock halters...and the "correct" way to attach the shank to the halter!! There are NO RULES about how this "must" be done! Not AQHA... not AHSA... nothing (at least at this time in all of the rule books I have checked)! Many judges, trainers and exhibitors have their "own" preference as to HOW it should be done... whether it's for safety, appearance or control... but it doesn't HAVE to be over the nose, under the chin... or doubled! There are no specific rules!